This week, we'll look at common aquatic creatures. 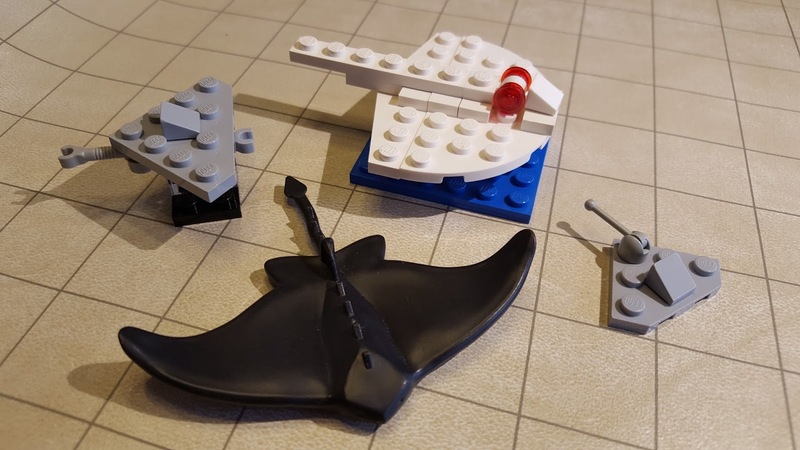 The LEGO group has produced a large number of ready-made animal figures, such as the starfish, dolphin, and two small fish shown above. 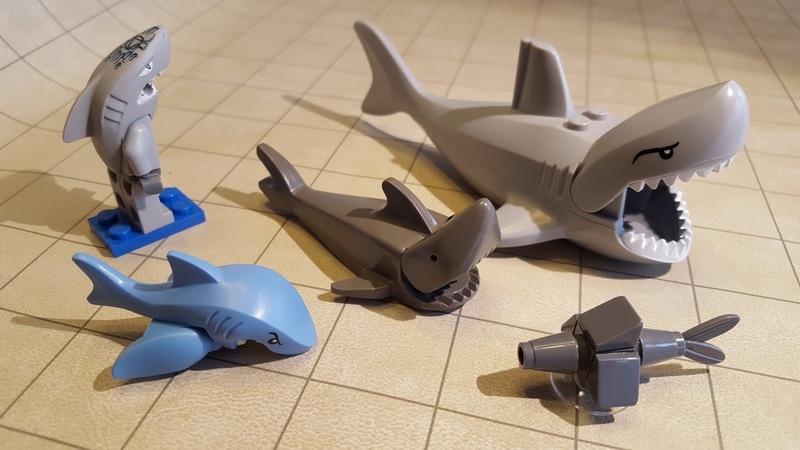 Some of these, like that silver fish and the classic shark and octopus, are common pieces that regularly reappear in new sets, so should fairly easy to acquire. Others have fallen out of production, or may not be the right size you need for a given monster, so you'll need to build one out of bricks. I'll be discussing both ready-made and built models in this column. The streamlined body of a fish is one of the most efficient forms in nature, as it maximizes the speed with which the creature can move through water. This is why most aquatic mammals have a similar silhouette, from the fluked tails of dolphins and whales to the flippered hindquarters of seals and walruses. Eels are most easily represented by snake figures. A larger eel can be built from a series of hinges (like those used for walls in my Spell Effects column) with additional details added. Rays are wide and flat, and can easily be built with a selection of angled and/or curved plates, with a few details such as tails and dorsal ridges added, as shown below. Most whales are Gargantuan or Colossal in size, so are a bit beyond the scope of what I want to cover in this week's column. 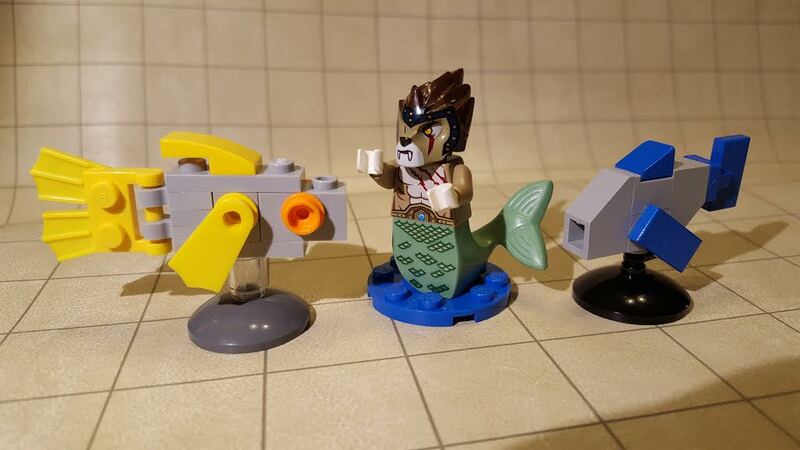 The Lighthouse Point set (LEGO Creator, set 31051) has a very nice buildable orca that is just about perfectly sized for a Huge creature. Single-piece LEGO dolphins can be found in the Friends and Elves themes, as well as some of the older aquatic themes (shown in the first photo in this column). 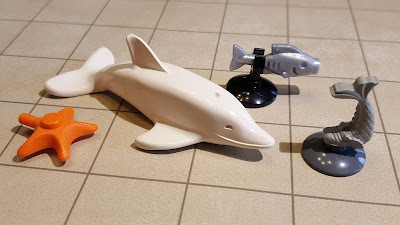 These are actually too big for use as Medium dolphin minis, so you may want to use the brick-built shark model shown above instead--just turn its tail fin sideways to make horizontal flukes. 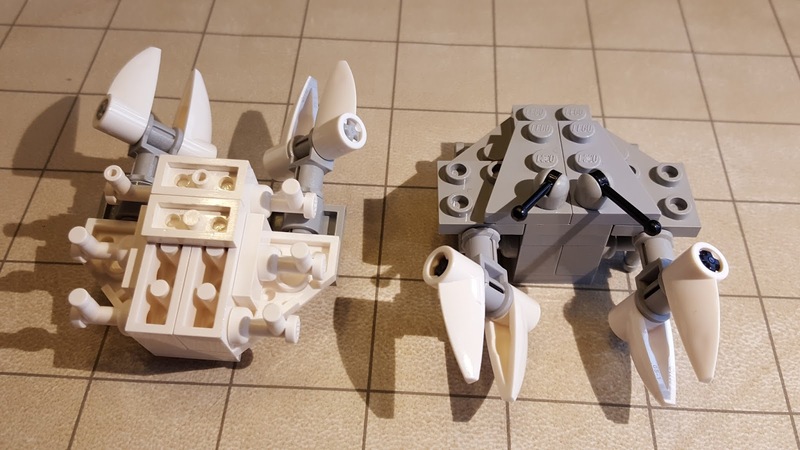 A LEGO crab figure has a bar-type attachment point built into its back, allowing you to clip on a tail to make it into a lobster. You can also make a simple crab of the same size out of a 2x2 round plate and a pair of 1x1 plates with side-clips (see photo below). The next photo shows the underside and top of a Large crab model. The body is made out of a couple of SNOT ("studs not on top") bricks with faucet-like pieces added to serve as short, bent legs. I then added angled plates to make the body shape more semicircular. The pincers are built out of Technic pieces, and inserted into Technic holes in two of the body plates. Some small plates were added to the base to lock the SNOT bricks together and to keep the model from tipping forward. Finally, two levers serve as antennae. 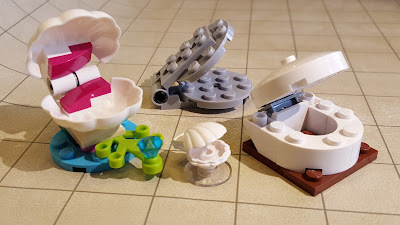 Small clams can be found in various aquatic-themed sets, but much larger clamshell parts were introduced in the LEGO Elves theme. 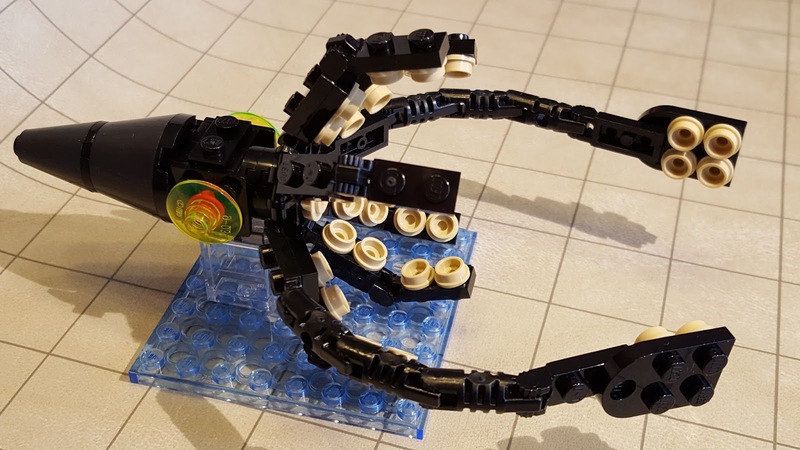 The large clam on the left side of the photo below is taken straight from Naida's Epic Adventure Ship (set 41073). You can also build a giant clam using round bricks and a hinge, as shown below. A small jellyfish (or each square of a jellyfish swarm) can be represented by a transparent "boat plate," crystal ball, or bell jar brick. A larger jellyfish will require some additional parts to give it tentacles. Seaweed and vine pieces are useful here, as shown in the models below. 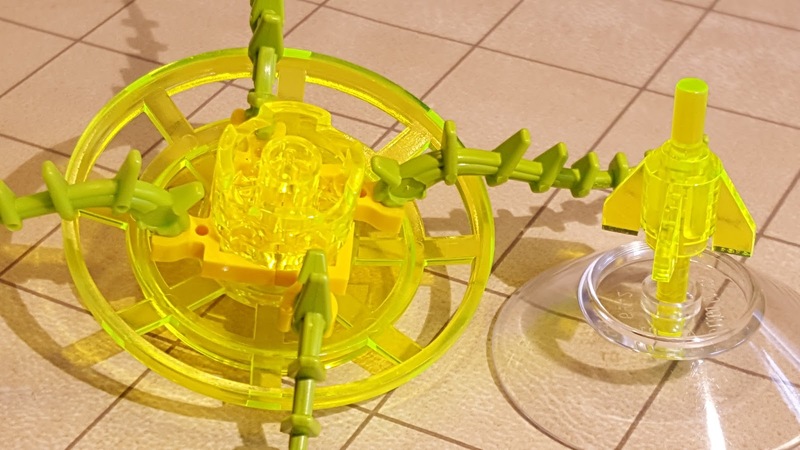 The second photo shows more detail of how the tentacles attach to the larger jellyfish's bell (which is made of stacked transparent radar dishes). 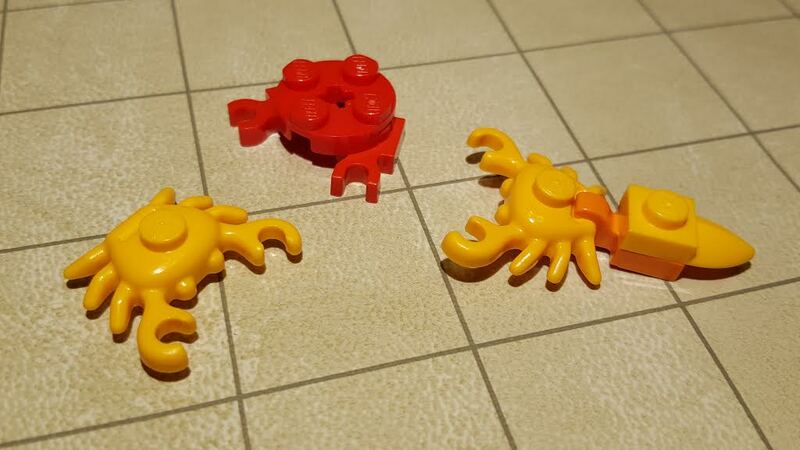 The four-pronged piece used as a base for ship lanterns makes an excellent starting point for a small squid. Just add a cone for a small squid, plus a couple extra pieces for a slightly larger one (see above). 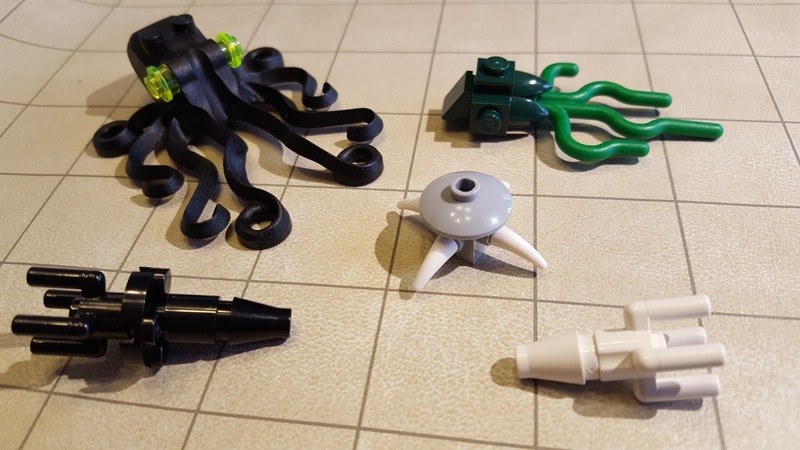 A giant squid, on the other hand, is a much trickier build thanks to its Huge size, at which scale its numerous limbs will be much more prominent. In the model below, I clipped hinged arms and tentacles to the bars of a net-like octagonal plate. A short Technic axle connects the center of this structure to the body; the small tan gear both anchors that axle in place and makes a great beak. SNOT bricks provide attachments for the eyes (transparent radar dish "corneas" over 1x1 plate "pupils"). 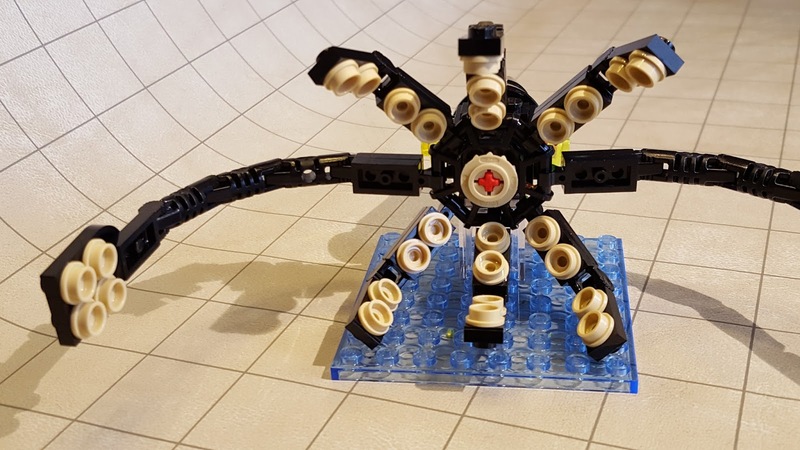 This model can be modified into a giant octopus (Large) by replacing the tentacles with shorter arms, shortening the body, and putting it on a smaller base. Similarly, it can be upgraded to a kraken (Gargantuan) by enlarging both the model and the base. The next installment of "Building the Bestiary" will address models for vermin miniatures. 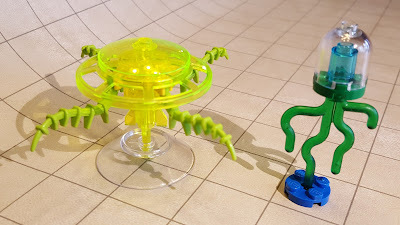 After that, lucky #13 in this series will be devoted to some iconic D&D creatures that are not Open Game Content, and thus not to be found in Pathfinder: beholders, mind flayers, and others. But I expect to have at least one more "Time of the Tarrasque" journal to write before we can get to those.